355 N. Rock Island Ave/803-811 E. Third St. Located on the southwest corner of East Third Street and Rock Island Avenue, the International Harvester Building was constructed in 1910. It is a four-story concrete building covered in red brick that was designed as a warehouse and office space to display and sell International Harvester vehicles and machinery. In 1902, five small farming equipment companies merged to form the International Harvester Company. By 1911, International Harvester Company was the leading producer of tractors in the United States. The building was once the anchor of a bustling district of factories, but is now one of the few remaining warehouses from that time. 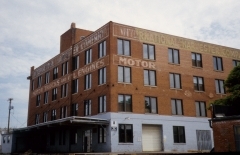 The building was nominated for its contribution to the industrial development of Wichita and as an example of industrial and commercial architecture. 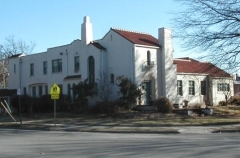 In the early 1920s, Charles M. Jackman hired well-known Wichita architect Lorentz Schmidt and contractor George Siedhoff to design and build his College Hill residence. Located east of downtown, the College Hill area was developing into a neighborhood that was home to prominent area businessmen and their families. The College Hill area featured homes of popular early twentieth century architectural styles, which by 1924 included Jackman’s Spanish Colonial Revival house. The house is nominated for its architecture. Constructed in 1930, the Johnson Drugstore Building is an excellent representation of the commercial building type known as Modern Broad-Front. The building exhibits chevrons in the Art Deco style through extensive use of Carthalite and glazed terra cotta detailing. It is nominated because of its distinctive architectural style and represents the collaborative work of the owner Gilbert Johnson, the builder Charles H. Walden, and the manager of the Cement Stone & Supply Company, Benjamin (Frank) Krehbiel. On March 18, 1953, the Kansas Gas and Electric Company announced plans for the construction of a seven-story office building on the site of their former offices located on the corner lot of First and Market Streets. 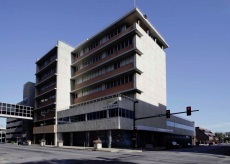 Planned by noted Wichita architects, Glen H. Thomas and Arthur B. Harris, also responsible for the design of numerous buildings in a variety of architectural styles in Sedgwick County, the KG&E Building stands as one of the firm's best examples of the Modern era. Designed in the International style, the building marks the beginning of the Modern era for the Central Business District and was the first in a major building boom for the city. Hallmark features of the building's International style include its form and massing, emphasis on the horizontal, ribboned fenestration, and large unadorned walls. The building is nominated for its architectural significance. The Kaufman Building was nominated to the Register of Historic Kansas Places as an example of architect-designed, early twentieth-century fireproof commercial construction and for its association with Wichita's wheat-trading industry during the 1920s. The Kaufman Building was designed for Hilbert Kaufman in 1922 by the Chicago firm Eberson and Weaver, which had also designed Wichita's Orpheum Theatre. Completed in 1924, the four-story Kaufman Building is a T-shaped two-part commercial block reinforced concrete structure with a brick façade that has retained its integrity very well. Kaufman was the president of the Stevens-Scott Grain Company, which was ranked the fifth largest milling market in the United States by 1928. 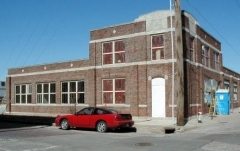 The Keep Klean Building (c. 1929) is significant for its association with the steam laundry and towel supply industries in Wichita and as an example of early twentieth-century fire-proof industrial construction. 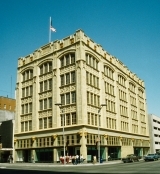 The exterior of the building represents the early twentieth-century Commercial style, which is most often seen in downtown commercial buildings from the 1910s and 1920s. These buildings had an emphasis on fire-resistance with fire-proof materials such as reinforced concrete, brick and steel. 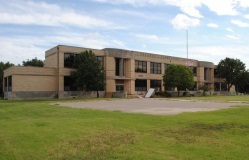 Kellogg Elementary School is located in Hunter's Third Addition to the City of Wichita, a one-block addition stretching from Kellogg Avenue on the south, Hunter Avenue (now Lewis Street) on the north, Laura Street on the west, and Pattie Street on the east. The first Kellogg School, a Richardsonian Romanesque-style building was completed in 1890. It was not until the 1910s and 1920s that the neighborhood surrounding Kellogg School was fully developed with small bungalows and cottages surrounding the school. By 1935, overflowing classrooms necessitated temporary classroom buildings northeast of the main building. The school district hired local architects Overend and Boucher to design the new Kellogg School, and Dondlinger and Sons Construction Company was awarded the contract with a successful bid of $113,980. Construction of the Art Moderne school was completed just in time for the opening day of school on September 8, 1941. The school was closed in 1996. 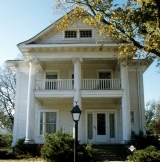 It was nominated as part of the “Historic Public Schools of Kansas” multiple property listing for its association with local education and its architecture. Built in 1910, by real estate speculator Elmer Brodie, the Edward M. Kelly House is a two-and-one-half-story frame Neo-Classical residence. The home is known for the three large ionic columns supporting the portico on the east façade. Edward M. Kelly purchased the home in 1914 and resided there until 1936. Kelly was the president and manager of Commerce Milling and Elevator Company as well as the manager of the Edward Kelly Grain Company. During a long tenure on the Wichita Board of Trade Kelly served as secretary, treasurer, and president. Upon opening in March 1950, Knightley’s Parking Garage (named for the garage’s manager) was Wichita’s largest garage, providing downtown visitors the ability to park and shop or work within a close proximity. Architects Overend & Boucher, with structural engineer George Hartwell, designed the Modern five-story, 500-car garage, embracing the latest technological advances in concrete construction. The garage is a rare surviving example of a Modern post-war, privately-owned and attendant-operated garage, in contrast to self-park garages that became dominant in the 1950s. A dual-function facility, the garage also served as home to the offices of Lauck Oil Company for more than 25 years. The S. H. Kress Company Building, located on the northwest corner of Broadway and Douglas Streets, is a five-story Commercial Gothic structure. The S. H. Kress Company opened its first Wichita store in 1908 and by 1928, the company decided to construct a bigger building as a result of the 1920s boom. Designed by G.E. 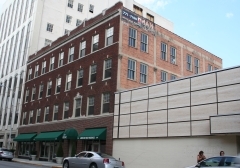 Mackay of New York City, who also designed the Kress Building in Emporia, the Wichita building was constructed between 1928 and 1930 by W.H. Bowen Construction Company. The first floor of the building was originally the sales floor for the Kress store. It is a single, large room with a double-height ceiling supported by square piers. The piers and rear wall are covered in marble with gothic detailing. Each pier has an ornate plaster capital. Much of this original integrity is still in place. The Kress company building was nominated as an example of Commercial Gothic architecture.